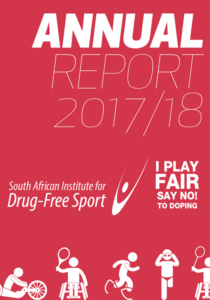 The SA Institute for Drug-Free Sport is pleased to share its Annual Report 2017/18 which includes an overview of its legislative mandate and strategic objectives, organizational performance and accomplishments, and financials as audited by the Auditor-General SA. A total of 1659 athletes were tested during the year. These included 1312 urine tests, 296 blood tests and 29 tests for EPO (erythropoietin). A total of 46 anti-doping rule violations (ADRVs) were detected during the period. A total of 23 tests were carried out on bodybuilders with 14 ADRVs, 11 of which were at one single competition – by far the highest in any single sports code. The second most tested category was a total of 391 tests amongst rugby union players, with seven ADRVs – three of which were from schoolboy-level players participating in the 2017 Craven Week Rugby Tournament. The names of these players have not been made public as they are minors. The overall number of tests were partially restricted in the 2017/18 year after the SA Doping Control Laboratory in Bloemfontein lost its World Anti-Doping Authority (WADA) accreditation. This meant that samples had to be couriered to WADA accredited laboratories overseas at a considerable cost. The laboratory is run entirely independently of SAIDS. A total of 126 Anti-Doping Education Events were conducted nationally during this period, covering a range of sports codes, from school to club, provincial and national level. SAIDS CEO Khalid Galant together with representatives from the SAIDS Board presented the report to Parliament’s Portfolio Committee on Sport on Tuesday, 9th Oct 2018. He said the number of ADRVs at schoolboy rugby level continues to be “alarming” and expressed concern at “the high tolerance of parents and coaches to doping practices”. This is based on the 122 tests that were done during the 2018 Craven Week Tournament and an alarming six players testing positive, all related to anabolic steroids. The corresponding number of positive tests in recent years was three in 2014, five in 2015, four in 2016 and three in 2017. Earlier this year Galant wrote to school rugby tournament organisers explaining the SAIDS Clean School Sport Policy, in terms of which “anti-doping detection, deterrence and prevention strategies will be extended to include in-competition testing at selected school sport events and tournaments”. This was being undertaken in collaboration with the SA Schools Rugby Association (SASRA) and was supported by the SA Rugby Union and the Department of Sports and Recreation. Galant pointed out in the letter that anti-doping education was an integral part of the policy. For more detailed information on South Africa’s sport doping control statistics, please read the full Annual Report 2018 (for the period April 2017 to March 2018).